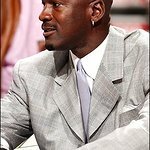 The Chicago Bulls have teamed with Hunt Auctions to offer fans a chance to bid on historic Michael Jordan gear – including his locker – with all proceeds going to the Chicago Bulls’ charitable organization, the CharitaBulls. A sampling of items available include one of Michael Jordan’s Chicago Bulls lockers, game worn jerseys, and autographed sneakers. The auction is now in the online pre-bidding phase and the live auction will begin April 18, 2009, at the National Italian American Sports Hall of Fame in Chicago. Click here to take part.